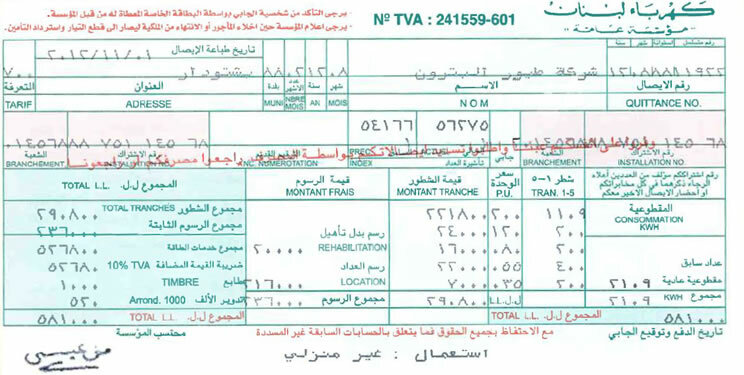 Cheque issued to BUS (BUTEC Utility Services) or EDL (Electricité du Liban). If you prefer to pay by direct debit from your bank account, please contact your bank. To get connected or to upgrade your current connection, please visit us in one of our divisions. Our customer services employees are happy to assist you with the connection you need. If you only need a meter and the network is ready, we can start connecting you right away. If your connection requires extra cables, poles or substations, we will do it in two steps. Step one is a technical study and step two is the execution. Application and payment are done separately for both steps. A processing fee, to be paid to EDL, is required for all types of applications. If you want to stop your electricity connection, please visit us in one of our divisions. If you are moving to another residence, you have to stop your current connection and apply for a new one.